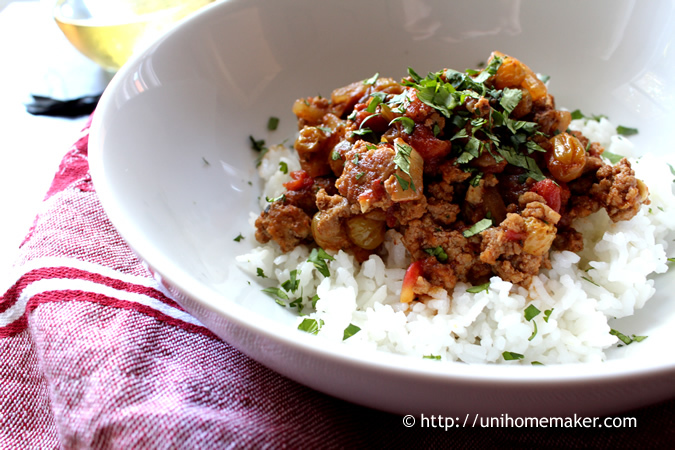 Picadillo is similar to a hash and is a traditional dish in many Latin American countries and the Philippines. It is often served with rice or used as a filling in dishes such as tacos, burritos, and empanadas (source: Wikipedia). This dish is a girl’s best friend. Why, you ask? Well for one thing, it is quick cooking and it’s packed with flavors. It is also flexible. You can use beef, chicken, and even turkey for a leaner version. This dish takes about the same amount of time to cook as you would to cook rice. So the next time you are looking to put food on the table in a hurry, and you want something flavorful, look no further!